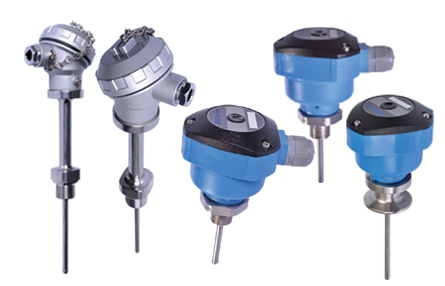 The Temperature transmitters are designed for temperature measurement and control in various industrial processes, laboratories and research centers. It uses technology known as Pt-100 or RTD, a high purity platinum wire resistance encapsulated in a ceramic bulb and mineral insulation, are based on the principle of variation of ohmic resistance as a function of temperature in a proportional and direct manner. The temperature transmitters transform the Pt-100 thermoresist value into current (mA) or voltage (V) values ​​that are directly proportional to the temperature. The ST90A series with Nylon or Aluminum housing is available in 4 … 20mA (2 wire) or 0 … 10V (3 wire) versions (upon reqeust). Both models offer a compact form without moving parts with reliable and accurate measurement. The electronic module with microprocessed technology has Zero & Span adjustment and can be re-calibrated for a new measurement range within its working range. HART communication protocol is also available, facilitating the integration of the transmitter to industrial networks. The ST90 series has a complete construction in 316 stainless steel, 4 … 20mA output without Zero & Span adjustment. High Temp Applications The ST20 model works at a high temperature up to 600 ° C.
Like all Sitron products, ST models can be configured according to the unique control needs of our customers. They can be purchased with a wide range of process connections and extender to meet high temperatures.